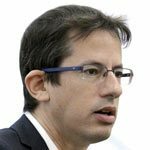 Hagai El-Ad is director of B’Tselem. El-Ad has a wealth of experience in human rights advocacy, including a six-year term as director of the Association for Civil Rights in Israel,as well as serving as the first director of the Jerusalem Open House for Pride and Tolerance. He holds an MSc in physics from the Hebrew University of Jerusalem and was a pre-doctoral fellow at the Harvard–Smithsonian Center for Astrophysics from 1997 to 2000.